The Wesco 10" Highliner is built for the everyday adventurer and climber; nothing is more suitable to the needs of your feet! This black beauty is very popular with the both the urban and rural adventurer as it combines the necessary ingredients to create an all-around useful boot. For climbing, you have a 430 Vibram sole to aid you, whether you’re traversing the cliffs of a mountain in the Rockies, scaling an electrical pole to do some work, or simply picking your way up a treacherous stairway in the big city. These hardy boots come with a non-corrosive, ribbed, and slightly arched steel shank, which comforts your foot and lessens the load on those poor calves during an uphill climb. A half-slip is added in for increased support. 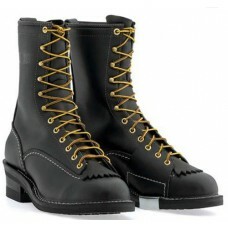 Wesco made these boots for all those who are sick of that burning pain in your feet after a long slog. Wesco prides itself on making boots for each and every situation you could possibly find yourself in. Although these boots are made for mountaineering, they are popular among everyday walkers as they protect your feet from injuries that may pop up with other boots. With the quality guaranteed to come from one of America's finest boot manufacturers, the Wesco Highliner is a wise purchase for both the boot enthusiast and climber.